Directed by George Miller and screenplay by Miller, Terry Hayes, and Brian Hannant, Mad Max 2: The Road Warrior is the story of a man driven by loss as he reluctantly help a group of settlers deal with marauders wreaking havoc during a post-apocalyptic period in Australia. The film is a sequel to the 1979 film in which Mel Gibson reprises his role as Max Rockatansky as he tries to cut himself off from humanity only to realize what he needs to do to regain. Also starring Bruce Spence, Vernon Wells, Emil Minty, Michael Preston, and narration by Harold Baigent. Mad Max 2: The Road Warrior is a thrilling and high-octane film from George Miller. The film follows a man who would go on the road with his dog as he finds himself dealing with crazed marauders where he later finds a small village with lots of gasoline that is being threatened by marauders as gas is now the biggest currency in this post-apocalyptic environment. It’s a film that forces a man to deal with the demons from his past as he struggles to survive with just by himself as he knows that there are marauders just creating havoc and doing whatever they can for one bit of gasoline. The film’s screenplay that feature opening and closing narration by Harold Baigent as an unknown character who describes the events that led to what has happened showcases a world that has lost its way. Max Rockatansky is just passing by trying to salvage whatever he can find as he would encounter a gyro pilot (Bruce Spence) where he would show him an oil refinery that is constantly attacked by the marauders. He agrees to help them retrieve an oil rig in exchange to get his car fixed and with his own supply of oil in return. Yet, things become complicated due to the marauders including a crazed henchman named Wez (Vernon Wells) who just likes to kill no matter what while he also wants revenge for the death of his companion in the hands of a feral boy (Emil Minty) that befriends Max. George Miller’s direction starts off with a montage filled with stock footage and images from the previous film as it relates to the chaos that lead to the events in the film as this opening montage is presented in a full-frame 1:33:1 aspect ratio before being presented in a widescreen format in the 2:35:1 aspect ratio. Shot on location near the mining town of Broken Hills, New South Wales in Australia, the film play into this world that is quite desolate and chaotic where it’s cars that kind of rule the land as they’re used as weapons all in the need to get oil so the marauders can wreak havoc. There are some wide and medium shots Miller uses to capture the scope of the location while he would use close-ups for a few moments in the action but most of its usage is on the characters in the non-action scenes as a lot of those shots are straightforward. In the action scenes, Miller maintains a realism in the way stunts are performed as well as the intensity of the action where much of it is on the road with some of it on the air. Miller also maintain some focus on what is at stake as well as identifying the people at the oil refinery who just want to live and restart their lives with Max unsure if he wants to help them. The film’s climax is intense as it play into the stakes as well as what Max has to do to help these settlers find hope. Overall, Miller crafts an exhilarating yet intense film about a loner trying to help settlers deal with marauders in a post-apocalyptic world. Cinematographer Dean Semler does brilliant work with the film’s cinematography with the natural approach to the daytime exterior scenes as well as the usage of low-key lights and fire for the scenes at night. Editors Michael Balson, David Stiven, and Tim Wellburn do excellent work with the editing as it captures the energy of the action with some jump-cuts as well as some transition wipes and dissolves to help play into the non-action scenes. Art director Graham “Grace” Walker does amazing work with the look of the cars as well as the oil refinery which looks a bit like a fortress. Costume designer Norma Moriceau does fantastic work with the costumes as some of the marauders wore some kind of strange leather gear with spikes and masks. Makeup supervisor Lesley Vanderwalt does nice work with the makeup from the look of some of the characters as well as the Mohawks of some of the marauders. Sound editor Bruce Lamshed does terrific work with the sound in capturing the atmosphere of the action as well as the sound of gun fire and engines as it add to the film’s chaotic tone. The film’s music by Brian May is superb for its bombastic orchestral score that add to the action and suspense as it is a major highlight of the film. The film’s marvelous cast include some notable small roles from Arkie Whiteley as the captain’s girlfriend whom the gyro pilot is fond of, Max Phipps as a marauders crier Toadie, Virginia Hey as a woman warrior who isn’t fond of Max at first, Michael Preston as the settlers’ idealistic leader Pappagallo, and Kjell Nilsson as the marauders’ charismatic leader Lord Humungus who is never seen without his mask as someone that wants to bargain with the settlers or else would cause mayhem. Emil Minty is fantastic as the feral kid who wields a boomerang that can kill people as he is fascinated by Max despite the fact that he never says anything other than scream and bite. Vernon Wells is excellent as Lord Humungus’ henchman Wez as this Mohawk-sporting marauder who is quite wild and vicious as he shoots arrows from his arms. Bruce Spence is brilliant as the gyro captain as a gyro-copter pilot who is kind of the film’s comic relief as a wanderer that is trying to survive as he would eventually be an ally of Max. 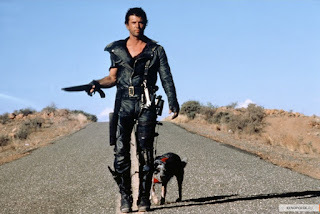 Finally, there’s Mel Gibson in an incredible performance as Max Rockatansky as a loner with an Australian Cattle Dog who is just moving along to not deal with anything as he reluctantly help some settlers as a way to get him back in touch with reality as it’s a very restrained yet chilling performance from Gibson. Mad Max 2: The Road Warrior is a phenomenal film from George Miller that features a great performance from Mel Gibson. Armed with dazzling visuals, high-octane action sequences, and a chilling story of survival in the post-apocalyptic world, it’s a film that offers so much in terms of what is expected in action films but also provide something more as it’s about a man trying to come to grips with loss and his reluctance to reconnect with humanity. In the end, Mad Max 2: The Road Warrior is a spectacular film from George Miller.